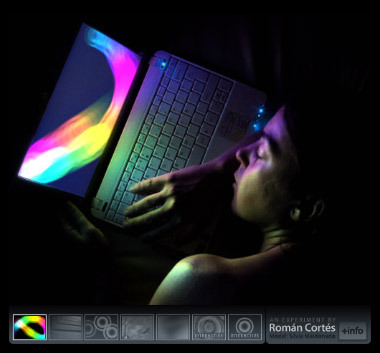 Inspired by the research of Paul Debevec on photographic relighting, I’ve created this Flash experiment showing a real-time relighted scene of my girlfriend with her netbook. Watch it here. Please note it requires a fast computer to run at full framerate. The scene has been captured without any special hardware, just a common reflex camera (Nikon D70) with its remote, a tripod and the netbook as the only light source. The time for shooting all the photos required for the relighting process was about 3-4 minutes, where Silvia — the Spanish for Sylvia — stayed amazingly static for the purpose. I’ve really enjoyed the development of this experiment because it mixes the most of my hobbies: photography, art, coding, technology, and also it has been a great opportunity to involve my girlfriend in any of my experiments. 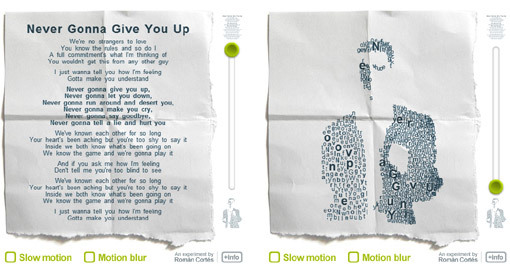 In this experiment/new visual effect, the letters from a lyric of a popular song – Never Gonna Give You Up — are repositioned to compose the images of its singer — Rick Astley — dancing in fluid motion. Take a look of it here. It is an evolution of an experiment I did a month ago where text compose a static image. In this case, I modified the algorithm to achieve the smooth motion by making the letters move the less as possible to be adapted to the next frame in the video. I’ve included an slider to morph from the lyrics to the video and two checkboxes, one for a interesting slow motion video where it is possible to see in detail how the letters move to create the different frames and a cinematic motion blur that also helps to see the motion, but that unfortunately requires a very fast computer to render at full speed. I hope you enjoy it! Have you ever wonder how a Van Gogh’s paint would look animated? To ask the question, I’ve developed a new 2d effect I call liquid paint and you can try it here. The usage is simple: draw lines with your mouse over the image following the paths created by the paint’s strokes. This is the ActionScript 3 port of the liquid paint effect. Due the heavy speed optimizations done to make the effect work smooth enough, the source code is a mess, but if you want to take a look here it is. I have to thank again Mr. Doob for his support and for teaching me the basis of AS3 coding. ¿Has pensado alguna vez cómo sería un cuadro de Van Gogh en movimiento? Para responder a la pregunta, he desarrollado un nuevo efecto 2d al que llamo pintura líquida y puedes probarlo aquí. Su funcionamiento es simple: dibuja líneas con el ratón sobre la imagen, siguiendo los trazos creados por las pinceladas del cuadro. Esta es la versión en ActionScript 3 del efecto. Debido a la optimización en velocidad requerida para que funcione a una velocidad razonable, el código es desordenado y confuso, pero si te interesa puedes echarle un vistazo aquí. Agradezco de nuevo a Mr. Doob su apoyo y el enseñarme la base de AS3 para poder realizar este tipo de efectos. Mr. Doob, a Flash expert and a great graphic designer shown me some days ago some voxel experiments he was doing with Actionscript 3. I have very few idea (nothing at all) of Flash, but I remembered some voxel head renderer I did years ago as a Windows executable and thought it could be done with a reasonable speed in Flash too. So, I asked Mr. Doob if he wanted to help me with the port, and here it is. It is medical data, a CT scan I got here. It was resampled to 512×512x512 and then coloured with radiosity. It looks a bit creepy in the mouth; these spikes are interferences caused by the tooth. Read the article Mr. Doob wrote about our creation. Mr. Doob, experto en Flash y genial diseñador gráfico, me mostró hace unos días unos experimentos de voxels con Actionscript 3 en los que estaba trabajando. Yo apenas se nada de Flash, pero recordé un renderizador de voxels que hice como ejecutable Windows hace años, y pensé que se podría portar y conseguir una velocidad razonable. Se lo comenté a Mr. Doob, y aquí lo tenéis. Los datos son médicos, un tac que encontré aquí. Lo redimensioné a 512×512x512 y lo coloreé con un algoritmo de radiosity para voxels. Se que da un poco de miedo, pero los agujeros y salientes cercanos a la boca son sólo distorsiones producidas por los dientes en el tac. El código fuente está disponible aquí.